If you’ve been in the stores recently, you’ve probably noticed that the Christmas stuff is gone, the Valentine candy is heavily discounted, and Easter baskets, plastic eggs, and pastel-colored candy now fill the shelves (with maybe a few shamrock items displayed nearby for a bit of Irish luck on St. Patrick’s Day). But between the “major holidays” of Christmas and Easter, we have the seasons of Epiphany and then Lent. 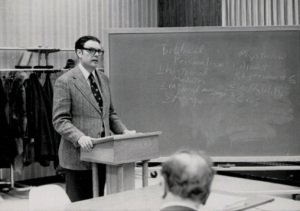 Donald Bloesch teaching at the University of Dubuque Theological Seminary. There are books that ought to be read. And then there are books that must be read. The Paradox of Holiness and Faith in Search of Obedience are books that must be read by those among us who seek to hear the gospel of Jesus Christ proclaimed in language we can understand—language that has the power to lift up our hearts, encourage our spirits, and strengthen our backbones. These books present us with a vision of God who is truly God; not a hobby or an image of ourselves, but God who—in love deeper, richer, and more demanding than we can imagine—reaches out to embrace all of us living amid the fractures, violence, and heartache present in the world today. Happy 140th Birthday, Martin Buber!